So I talk a lot about diseases here, but it’s because so many of us have been bred by our world to feel and be sick. We gain an identity on focusing on the aches and pains that we have. Our knees, back, or stomachs hurt. They slow us down and shrink our size. Our will to get out and do, see, and experience. They beg us to give them attention and reach tendrils of pain up to our minds to tie the small nooses around our ankles as we set goals to get out and thrive, at least a bit of each and everyday. I woke up today soooo stiff, but decided to fight back in a way that I always intend to, yet never seem to get around to. I stretched. I did a small workout following a timer and prompted. I pushed my muscles, arms, and legs just a bit past the pain. And as I did, I pictured a place that I want to be in life someday (Ireland) instead of focusing on the fact that the Table Pose feels so unnatural and foreign. I’ve done it a ton of times so I know with authority that, despite the fact that my mind tells me otherwise, my arm will not break and my shoulder will not pop out of its socket. I also know that if I breathe right, the pain will lessen, the muscles will relax, and I’ll make it at least 15 seconds further than I thought I could. The funny thing as well, is that I know, given more time, practice and patterning – eventually this interval of time will seem like nothing. I find the study of human beings and their reaction to challenge fascinating. For every person there is an equal and varied reaction to challenges. Some cave and some rise. Some are effected by the nature of the challenge, myself included. Though faced with medical challenges, I am not daunted by them but instead terrified by the chance to get off in the register count at work. The fear will keep me counting in my sleep or obsessing over where the difference may come. It makes me want to assign the responsibility to someone else, so I don’t have to obsess over it. Even this in and of itself is an illness of sorts. The illness of perfection. Of success. Of dotting all the I’s and crossing all of the T’s . It has, stopped me more than once from doing something great or striving for things comparable to my education and/or level of professional experience. Believe me, this is the beast that bites my ankles more often than not – and an “illness identity” I hope to send back to the factory sooner than later. I watched this identity of illness be the defining role of my father for almost as far back as I can remember. At a fairly young age, he was diagnosed with a variety of ailments. Suddenly, the active life that he loved and lived was replaced with a life in which he absolutely obsessed with every ache and pain. Medications, doctors, and other general conversation was ladened with “woe is me” commentary. At 59, he announced that it was more than likely the year he would die because his father had died in April of his own 59th year. And you know what, 6 months almost to the day after my own father turned 60, he passed away. I’d like to think if he had to do it over, he might choose to focus more of his energies on perpetuating his moments of health and in turn he might have had more of them. Abraham Hicks says in His “Law of Attraction” series that we must call into our minds the health and happiness we hope to see. The more we focus on the positive of things, the more the goodness and health will snowball into itself. This does not mean that we will never be sick or challenged, but more than likely those periods of illness will be more brief and our recovery will be swift. Let’s take their advice and stop allowing our illnesses of mind, body, and spirit to control us. Let’s choose to focus on the good things that we are, do, and have. 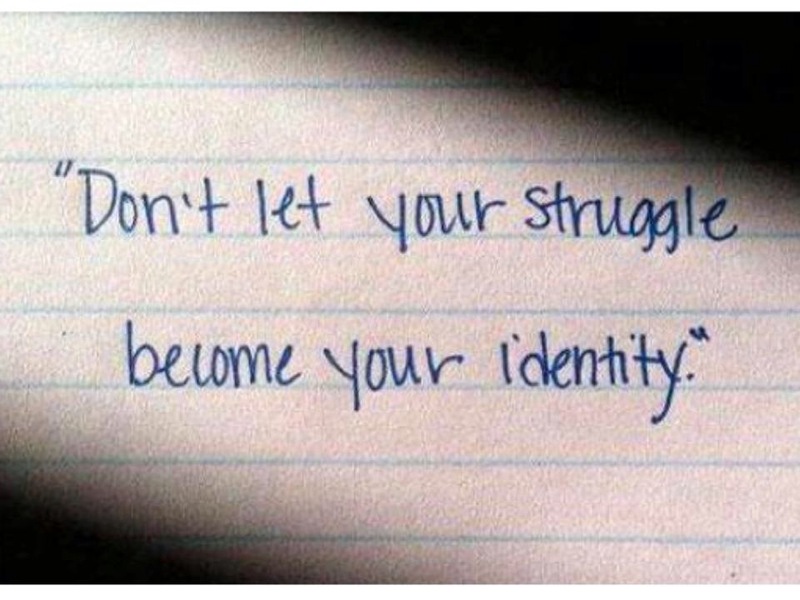 In doing this, we will be able to shed our identity of illness and instead thrive in our identity of success. Of potential. Of warmth and light. We all have great callings and potentials to do amazing things. As we set down the burdens of illness, we will find our arms open to embrace so much more.